The Sun is usually thought of as a fundamental source of visible radiation, but it also provides both a source of, and controlling influence on energetic particles which arrive in the earth’s atmosphere. These enter the atmosphere all the time in the form of galactic cosmic rays, together with episodic bursts of particles from the Sun such as solar protons. The latest work considering possible effects on these particles on different layers of the atmosphere was presented last week at an international workshop held in the Department of Meteorology at Reading, organised through the EU project called TOSCA, an acronym representing Towards a more complete assessment of the impact of solar variability on the Earth’s climate, although, in fairness Puccini got there first. 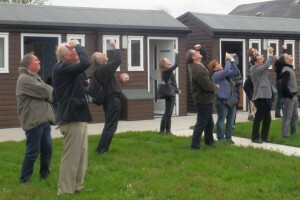 Delegates at the TOSCA meeting study upper levels of the atmosphere at the University of Reading Atmospheric Observatory, using a balloon-carried instrument to measure high energy particles. Advancing the scientific leitmotif TOSCA presents is a complex inter-disciplinary problem as it requires expertise in both the types of energetic particles considered and the properties of different layers of the atmosphere. Transport between these different atmosphere layers may also be relevant. For example, solar protons lead to generation of the chemical species HOx and NOx in the mesosphere, which can then propagate down into the stratosphere. Transient depletion of ozone in the stratosphere may also be associated with solar protons. Beyond these direct and indirect effects on atmospheric composition – arias perhaps – some atmospheric processes are thought to be influenced by energetic particles. This can occur electrically – many energetic particles cause ionisation – or by initiating a chain of processes yielding the production of particles on which clouds can form. One interesting possibility in the category of electrical effects is triggering of lightning by energetic particles. This requires an electrified cloud to form conventionally, but, after large electric fields have been generated, lightning may be initiated following ionisation from a burst of energetic particles. Unlike Puccini’s opera, this TOSCA has little melodrama, but a reliable account of energetic particles entering the upper and lower atmosphere is needed. Satellites can provide measurements of solar protons, and surface neutron monitors give information on cosmic ray decay processes in the lower stratosphere, but detecting the constant ionisation in the troposphere requires a direct in situ measurement. One important set of observations is the series of balloon measurements made by Moscow’s Lebedev Institute since 1957, now undertaken at three sites globally between Moscow, Murmansk and Mirny (Antarctica). These balloons carry a special radiosonde which is able to detect cosmic rays and energetic particles. Launches are made three times weekly, simultaneously across the three sites, and only minor changes have been made to the instrumentation throughout the duration of the measurement series. With what amounts to an exceptional solar recitative in recent years, probably associated with its emergence from a prolonged active phase throughout the Space Age, the true value of these long term measurements is now powerfully apparent. It is almost impossible to imagine how to make a scientific libretto strong enough to argue for over fifty years of future measurements. Even measurements of Antarctic ozone or tropospheric CO2, which are now regarded as pivotal datasets in modern atmospheric science, have come perilously close to abolition. Science can sometimes appear to be no more than a series of ad hoc projects, often driven only by fashion, to which the Lebedev measurements provide an impressive counter-example of dedicated monitoring, miraculously surviving major political upheavals. This entry was posted in Academia, Conferences, Environmental hazards, Space. Bookmark the permalink.